The Lido House Hotel, currently under construction at Newport Boulevard and 32nd Street, is going to be quite the destination for both locals and tourists. With a spacious wood deck for gatherings, a 2,248 square-foot restaurant, rooftop bar, luxury spa, and pool, the Lido House may be the crowning jewel of the Balboa Peninsula’s revitalization efforts. Due to open in March, the hotel near Lido Marina Village will be operated by Marriott as part of their Autograph Collection. 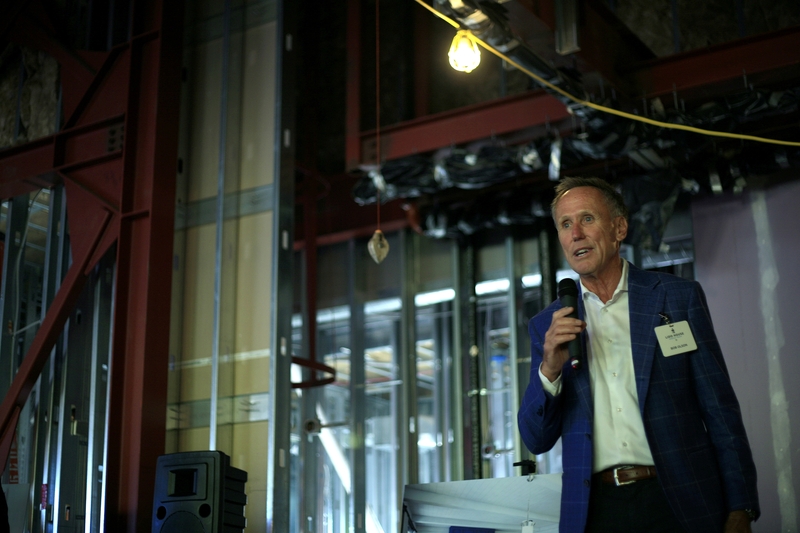 VP of Construction and Development Dennis Reyling talks about the details of the rooms during the tour. About 50 people, comprised of residents, local officials, and media, attended a sneak peek tour on Sept. 21. The neighbors seem to agree. Lido Isle residents Warner and Nancy Wimer took part in the tour and are looking forward for the boutique hotel to open its doors. 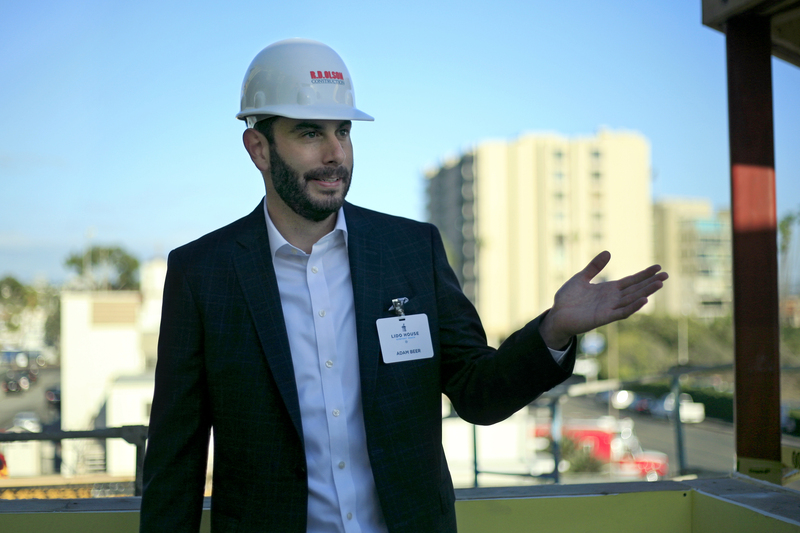 Lido House General Manager Adam Beer envisions – and hopes – local residents will visit, hang out and enjoy the amenities the hotel has to offer. “We want to be a positive influence on the community,” Beer said. The main concern raised by residents is a common issue in Newport Beach: Parking. Staff will park on-site, but they are working on other solutions during the busy times, including possibly shuttling them in or buying bus passes, Beer explained. Lido House will offer 130 guest rooms, five suites, two executive suites, and one presidential suite. Possibly the most covetable reservations in town will be one of five luxuriously-designed, three-story cottages. Each has its own parking spot, two bedrooms, full kitchen, washer and dryer, and its own private rooftop deck with grill and fireplace. What sets the cottages apart is that each one will be completely unique. All five cottages, each about 1,300 square feet, will have a different layout and will be decorated by different Newport Beach-based interior designers, so each will have its own personality. The cottages were designed with longer stays in mind and built by Costa Mesa-based home builder Matt White, who also designed Bob Olson’s home. Bob Olson, CEO of R.D. Olson Development, the company building Lido House Hotel, speaks to the tour attendees. Many locals on the tour agreed that the boutique hotel was a bright idea for the community. Olson, CEO of R.D. Olson Development, the company building Lido House, said the hotel is inspired by his Balboa Island home. Those who have been to his house will recognize many details. Even the color of the guest room doors are the same dark cranberry color of his own home. “It’s one of a dozen colors that you’re allowed to paint your door in Martha’s Vineyard,” he explained. Most of the hotel is indeed built with Cape Code-style architecture in mind. “It’s Cape Cod, but with a Newport twist to it,” Reyling said. Olson coined the term “Newport Nautical” for the hotel. 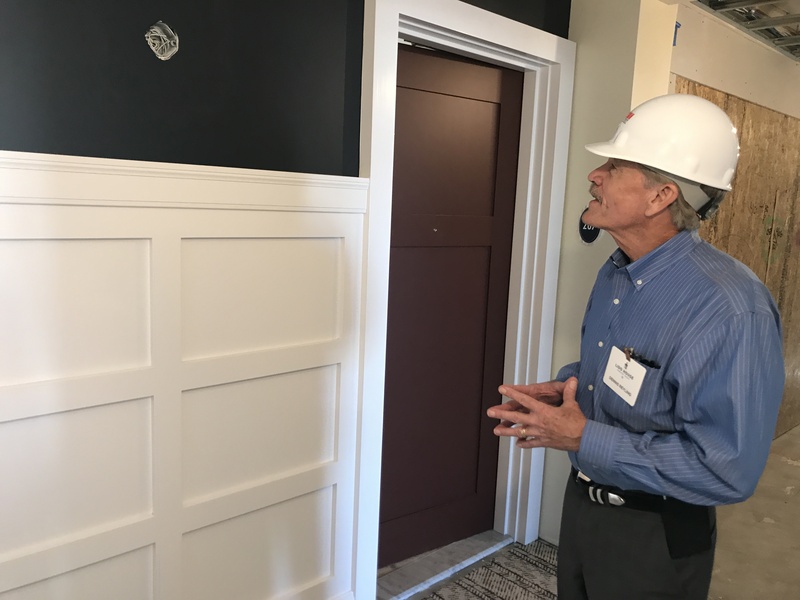 Former Newport Beach mayor Ed Selich, who was also part of the crowd getting a sneak peek of the hotel, said he’s excited about the architectural diversity the hotel will bring to the city, which already has a wide range of style. Nautical nuances can be found in guest rooms as well, with lots of white, yellow, and blue in the model rooms on display. Cozy interiors look out onto balconies or small decks in nearly all rooms, revealing a harbor or ocean view. 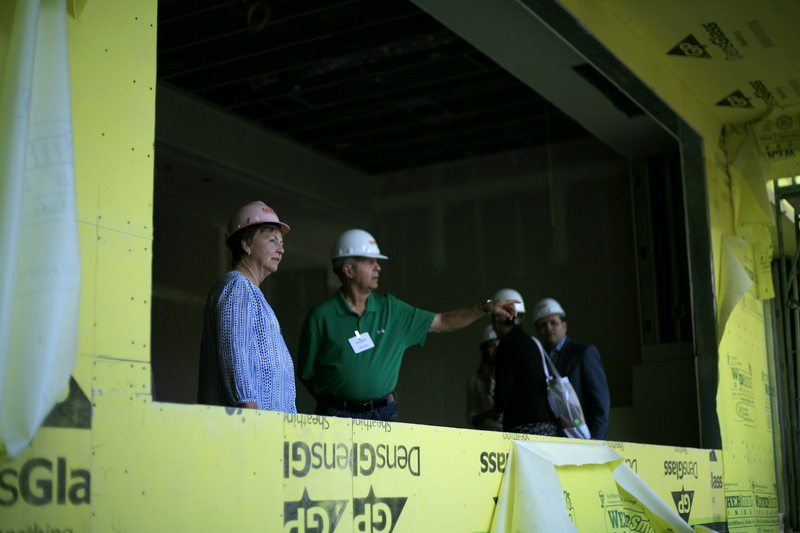 Guests look over the future courtyard area from the spa room at Lido House Hotel. ”We wanted it to have a bit of a residential feel,” Reyling said. The non-hotel feeling applied to bathrooms too, he added. Most Marriott hotels have an open shower design in their guest rooms, but Olson and his team decided against that. All guest bathrooms will have showers that are enclosed in glass. “The six-foot shower is big deal for us, we’re big believers in that. We like it to feel like a steam shower, so we completely enclosed it,” Reyling noted. For those not spending the night, there will be several ways to spend time at Lido House. Crew Coffee and Cremerie will offer locally-roasted coffee beans made and syrups made in-house. Crew will also make its own ice cream with signature flavors. “Crew is designed to be a separate, free-standing enterprise,” Reyling pointed out. Beyond Crew will be a large wood deck, stretched beneath the two large ficus trees that locals requested remain on the property, which Olson worked hard to include in the design. People may enjoy their coffees or ice cream here beside a fire. Guests may also sip a cocktail from the bar at the Mayor’s Table, the large restaurant whose name hails from the property’s former use: Newport Beach City Hall. When it opens in March, the Lido House Hotel will be one of only seven hotels on the Balboa Peninsula. It may also be one of the most expensive, as rates start at $300 per night for a standard guest room. The unique cottages start at $1,500 per night. Online reservations are available at marriott.com now for dates after April 14, but not through the entire summer. Beer said that the team is waiting to see how things go earlier in the year before more reservation dates are opened. Not since the Pelican Hill Resort opened in 2008 has a resort been so anxiously anticipated by a community. While the Lido House is much more intimate than the sprawling Pelican Hill, it is likely to draw the same wealthy clientele. And their furry friends. Lido House will have a fairly liberal pet policy. For $75, up to two pets will be allowed per room. “We welcome all well mannered dogs, cats, birds, and fish at a non-refundable fee,” reads the hotel’s website. What people seem to love most though are the people behind the project, particularly Oslon who has put much of his time and passion into Lido House, Beer said. Bridget Bilinski, Area Vice President of the Western Region and The Americas for Marriott said that working with Olson and his team has been a delight. Selich, who was on City Council when Olson’s project was selected and when it broke ground, agreed. For more information, visit lidohousehotel.com.